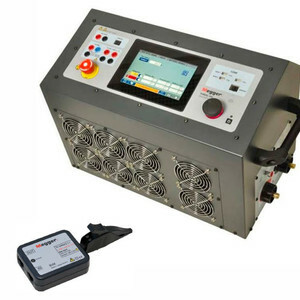 The Megger Torkel 950 is used to perform load/discharge testing to determine the true capacity of battery systems. A 200 ADC current clamp that allows on-load testing is included with the kit. It can be programmed for constant current, constant power, constant resistance or other user-defined load profiles. It is available to rent from TechRentals. When connected to the included BVM300 battery voltage monitor and logger, the unit becomes a complete discharge test system enabling cell-by-cell voltage measurement. This allows the user to easily identify the battery string that failed the load test. The tests are controlled by a built-in PC and results can be copied over to a USB memory stick. The 950 works with battery systems ranging from 7.5 to 500 V and can discharge at up to 220 A. The test can be carried out without disconnecting the battery from the equipment that it serves. The unit will sound an alarm when the voltage reaches a level slightly above the final voltage. If the voltage drops to a level where there is a risk of discharging the battery, the test will stop automatically. APS Industrial is now offering the Siemens SIRIUS ACT range of push-buttons and signalling devices. 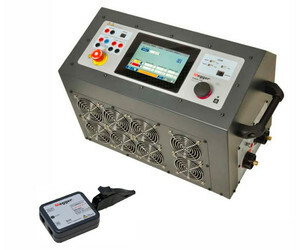 I am interested in Megger Torkel 950 battery discharge tester .